Heavy-duty shelving where pallets rest on a front and rear beam. High-density pallet storage where pallets are loaded from the rear and flow forward to a picking position. Inclined shelves with heavy-duty skate wheel track let product flow forward, powered by gravity. Storage density with easy selectivity. Pallet loads are placed on a series of nesting carts fed forward by gravity on rigid structural steel rail. As a pallet is loaded from the front, it pushes the pallet behind it back one position. To unload, select front pallet and the pallet behind comes to the picking position, automatically. Extremely dense storage of pallets on rails that run the depth of the rack system. 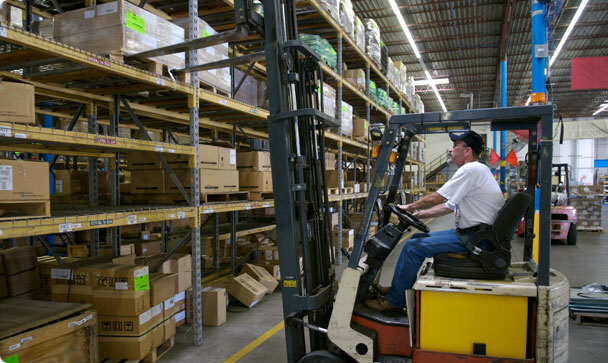 A common entry and exit loading point requires the forklift operators to drive into the racking system for pallet placement. Heavy-duty shelving where boxes or cartons are placed on a shelf created by adding decking to a front and rear beam. Gravity powered system which uses small wheels or conveyor lanes to move cartons through the pallet rack to a picking position. Separate loading and unloading aisles allow first in product to flow forward and rotate automatically. Intermediate shelving which divides a bay to accommodate different box or carton sizes. Heavy-duty shelving where bins are placed on a shelf created by adding decking to a front and rear beam. Gravity powered system which uses small wheels or conveyor lanes to move storage bins through the pallet rack to a picking position. Separate loading and unloading aisles allow first in product to flow forward and rotate automatically. Intermediate shelving which divides a bay to accommodate different size bins. Heavy-duty shelving where product pieces are placed on a shelf created by adding decking to a front and rear beam. Pieces may be placed in bins or cut-case cartons onto a gravity powered system with small wheels or conveyor lanes. Separate loading and unloading aisles allow first in product to flow forward and rotate automatically. Intermediate shelving which divides a bay to accommodate odd sized product and store pieces vertically or horizontally. Specially designed accessories to help store odd-sized product safely and keep them in place.